Consisting of framework structure built with coated pipe and joint components, Kanban Stations include plastic dividers and spacers, which when assembled in frame, provide compartmental storage for cards. Dividers/spacers fit together without adhesive. Modular units can be stacked in numerous width-height arrays to provide number of slots to match users' needs. Kanban Stations are available as stationary structures or with casters for mobility. In developing lean manufacturing strategies, one has to be careful not to outweigh the improvements with burdensome methods. Take for example the time proven 'Kanban' system, the series of cards containing routing information, process procedures and component data required for the manufacture of products. The cards represent visual cues that follow their component through the production flow, helping to control work-in-process, inventory and just-in-time production. The Kanban system allows participants to achieve objectives of reducing costs by eliminating waste and scrap, improving quality control, developing flexible work stations responsive to change, and allowing workers to reach their maximum potential. The drawback? A Kanban system can add confusion and disorder to the process if not implemented with its own level of simplicity, organization, and built-in visual management. That is, a large, bulky filing system for storing and distributing the cards can quickly undermine its acceptance and use. Typically, creating one's own Kanban station can be expensive, labor intensive and the results may not be as flexible or uniform as originally hoped for. One way to keep a Kanban system lean, however, is with the new Kanban Station created using components from Creform Corporation's time-proven adaptive material handling system- the Creform® System. 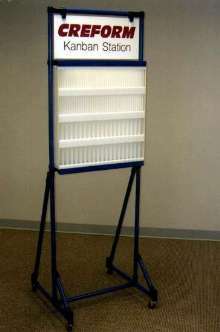 A Creform Kanban unit can be designed and sized to meet individual application requirements consisting of a frame work structure built using Creform's coated pipe and joint components and the firm's new series of plastic dividers and spacers which, when assembled in the frame, provide compartmental storage for the cards. The dividers/spacers are designed to fit together without adhesive and are secured as a single element by the framework. The modular units can be stacked in numerous width-height arrays to provide the number of slots that match the users' needs. The lightweight Creform Kanban station, along with Creform hardware components such as casters, allows the unit to be constructed as a highly mobile station that can be used throughout the facility-or it can easily be built as a stationary structure. Additionally, the agility of the entire Creform System means the Kanban station could be integrated into the design and construction of a workstation, flow rack or kitting cart made from Creform elements. The Creform System is a material handling concept...more than a product, it is a series of resin-coated pipes, metal or plastic joints, fixtures and hardware accessories that can be easily sized and assembled by users and operators-the people who know the job best, into a host of multi-task material handling structures. Besides Kanban stations, other representative examples of Creform-built structures include push carts and trailers; flow racks; roller conveyors; hinged shelf carts; tilting racks and tables; height adjustable work tables and workstations along with the portable tool cribs and storage units. Static discharge-rated ESD structures can be built for handling sensitive electronics. The Creform System can also be used to implement economical and easy-to-install AGC's (Automated Guided Cart) systems for efficient automated material delivery units. The Creform System is a leading contributor to lean manufacturing initiatives and a major element SMART programs... Simplicity to create custom structures for specific jobs-the Mobility of lightweight and maneuverable units-Adjustable to refine for optimum ergonomics-Reusable components for economical material handling solutions-and Temporary, thanks to low investment levels, that encourage improvement when needed.